On Sunday, December 7, 2014 massage therapists from all over the state convened at the Cape Codder Resort in Hyannis for the winter session business meeting. Chapter President Lisa Parenteau opened the meeting by welcoming everyone. She made a special point to acknowledge Barnstable Representative Brian Mannal and his wife Sarah. Lisa also recognized the 16 volunteers that were training in Community Service Massage Therapy group prior to the business meeting. Kelly Dalbec was called up to award six new members and seven first time chapter meeting members with an AMTA pin. The Keeping It Warm hat and mitten drive was mentioned. 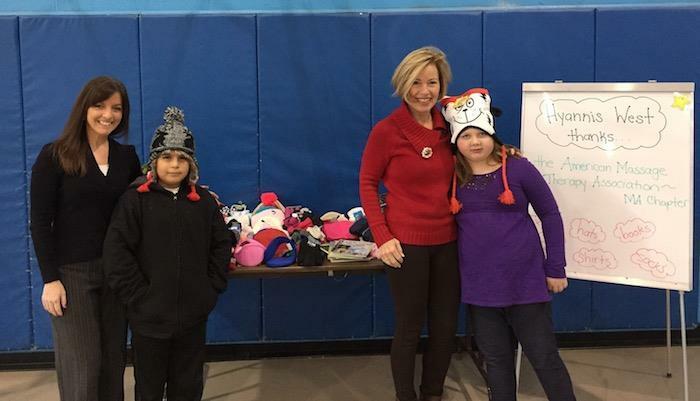 A good amount of hats and mittens were collected and donated to a local organization. Mary then turned the meeting over to Barnstable Representative Brian Mannal. Rep. Mannal went into what it takes to get a bill passed and gave some statistics on how bills many go into committee and how few make it out. There is also a time limit on bills; if they are not moved through within a certain time they ‘die’ and need to be refiled and the whole process must be started over. He then relayed how close we are on this bill, how much work has gone into it, how many members have testified on behalf of it, but that we’re not done yet. Rep. Mannal urged those in attendance, and now by proxy, you, the reader, to reach out to their legislators (search by district on this link) on the phone, write a letter or visit her/ him personally in support of HB 185. Representative Mannal went on to convey that the illegal industries of prostitution and human trafficking are using our industry to hide behind. This issue is in our back yard and for every shop that gets caught, others are out there that we are unaware of. One of the ways to make a difference with this problem that our industry faces is to show your support for House Bill 185. Mary White reiterated that we need to contact our Representatives in support of HB 185. Lisa Parenteau took the time to mention the new One and Done program that will be offered next year, in 2015. Continuing Education Units will become a part of our licensure responsibility. We, as AMTA-MA Chapter members, will have the opportunity to complete our yearly CEUs in one weekend. There will be more information to come as we get closer to our May business meeting. Lisa also mentioned that the Day on the Hill event was a big success. Over 200 legislators and their staff received chair massages and the State House had a day of relaxation. Be sure to sign up for Day on the Hill 2015, which will be in October. Richard Wedegartner, AMTA -MA Chapter Past President, was introduced to talk about the Affordable Care Act and how LMTs should be a part of the health care system as a whole. In the current state of affairs, billing codes do not reflect what we do, like pain management. As an example, he explained how opioid addiction begins with prescription drugs. When a prescription runs out, patients get into street opiates which are cheaper and more available. However, if massage were implemented into a patient’s care plan for pain management instead of opiate prescriptions, perhaps we could have a positive effect on the problem of opiate addiction. A legislative report will be available online on this subject. Deb Baker, AMTA- MA Chapter Education Chairperson, was introduced and conveyed some upcoming events. She mentioned the Neuromuscular Therapy weekend seminar, facilitated by Katie Adams, that was in progress. Future education opportunities for 2015 include a 2-day low back seminar with Ben Benjamin in February at the Crown Plaza and the One and Done session in May at the Needham Sheraton. The May weekend is loaded with education seminars and workshops- facilitated by James Weslowski, Michael Whitely and Ruth Warner, to name a few. Lisa spoke about IDEA, which stands for In Depth Education for All. The idea (pun intended) is to offer plenty of education for all, AMTA members and non-members. When you put together the legislative issues, health care issues and massage industry issues in general, education and training is the key to success for all legitimate MTs. Also, because the New England Regional Conference (NERC) is in its final year, there will be an education vacuum to fill. Lisa then introduced Jessica Meltzer to talk about New England Regional Conference. Jessica mentioned that the final NERC will take place next year in Framingham, MA. The event is March 19th to the 22nd and is hosted by the Maine AMTA Chapter. At the end of her talk, Jessica urged everyone to attend this final conference for the New England Region. Gail Dobinski, 3rd Vice President and Member Experience Chair asked members to fill out a survey called What AMTA Means to Me. She also urged members to volunteer for the Mentor Program. Gail also pointed out the table that had sign up sheets for some of the many opportunities to volunteer. They included Gordon Pilotte’s Community Service Massage Team (CSMT), Day on the Hill 2015 to name a few. Additionally, any member can volunteer for any committee with the MA Chapter. Finally, Gordon Pilotte stood up to talk about the CSMT. This is a group of MA-Chapter volunteers designed to provide massage therapy to support the well-being of those who serve their communities in times of crisis. To become a CSMT volunteer, contact Gordon at csmt@massamta.org.